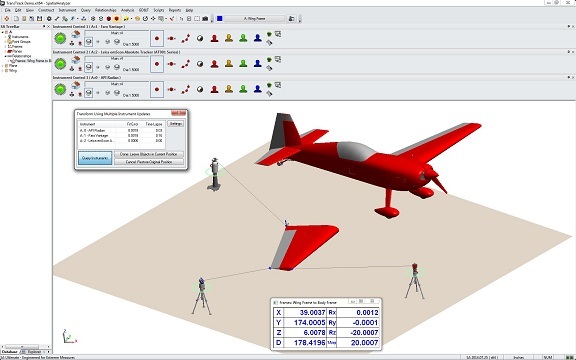 With SpatialAnalyzer, you can connect with as many trackers as needed (or instruments of any type) within the same job file, and measure with them simultaneously. A critical component to connecting more than one instrument is making sure you have an open pathway of communication between the computer and each individual tracker. Each of the instruments need to be connected in some way to the computer running SA. A simple network switch or hub will allow you to connect the ethernet cables from each tracker to your computer at once through the switch. The other option is to use a wireless network, since many trackers provide wireless connections. As long as your computer has wireless capability, you can connect to multiple trackers across a common wireless network. You can also mix and match, connecting to one tracker with a cable and another tracker through a wireless connection. Each tracker manufacturer uses a unique default IP address which is set on all of their trackers. The default IP address for Leica trackers is 192.168.0.1, Faro’s is 128.128.128.100, and API uses 192.168.0.168. If you want to connect to more than one tracker of a particular type on a network, you will have to change the IP address of one of those trackers so that they each have a unique IP address. This will allow SA to talk to each tracker independently. An IP address consists of four numeric fields (octets) separated by decimals that define the communication path to the instrument and the computer (for all TCPIP connections wireless or cable). Assuming the subnet mask is 255.255.255.0, the first three fields set the network address and the last field identifies the host address. So, if you change your second Leica tracker to 192.168.0.2, only changing the host address (192.168.0 is the network address and 2 is the host address of your instrument) you should then be able to connect to both a default instrument and the second instrument at the same time. Each manufacturer provides its own procedure for allowing the operator to set the tracker’s IP address on the controller. Remember that your computer must also have an address on the same network. In order to communicate, each device must have the same subnet mask, network address, and a unique host address between the numerals 1 and 254. While we are restricting the discussion to consider only a subnet mask of 255.255.255.0, other settings are possible. The important point is that the subnet mask determines how to divide the IP address into the network address and the host address. Additionally, it is occasionally necessary to use multiple networks, but that is outside the scope of the present discussion. Figure 1. Basic IP V4 Configuration for a static IP address. There are cases when connecting to two trackers that are set on different networks is necessary, such as connection a Faro and an API tracker at the same time, without changing the trackers’ IPs. It’s straight forward to set your computer to talk to either the 128.128.128 network or the 192.168.0 network, but to talk to both at the same time you need to have two IP addresses set on your computer. 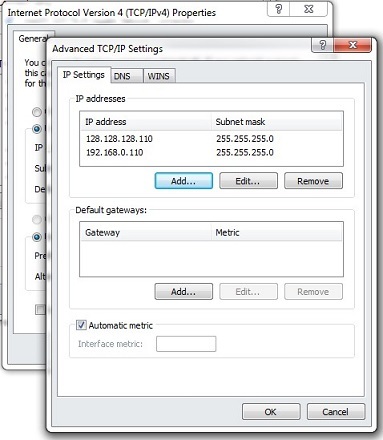 You can add additional IP addresses by setting your computer to a fixed IP address and then using the Advanced button in the IPv4 Properties. By using the Add button you can add additional IP addresses on different networks. This allows you to pair up either tracker with your computer and see that the computer and the tracker have a unique address on the same network. Figure 2. Setting two separate network addresses to connect to trackers on different networks. Figure 3. Faro Connection Dialog with IP settings and startup controls. Enter the IP of the tracker in the Tracker TCP/IP Address dialog and press the Ping button. You should get a reply from that address. Figure 4. Successful response after pinging a tracker. If you don't get a reply, verify that the tracker’s IP is entered correctly. 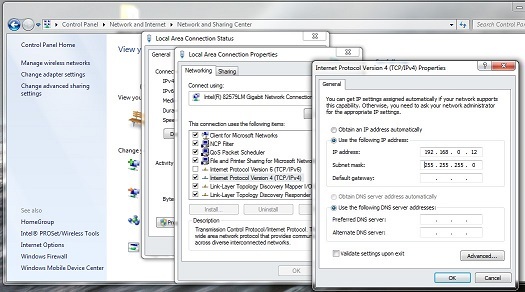 Check the connection of each tracker independently and confirm that each one and the computer are on the same network with unique IP addresses, whether that be on a local area connection or a wireless connection. Wireless trackers typically use an entirely different default IP address than its wired IP address. For example, the Leica AT402 uses 192.168.250.1 and the Faro Vantage uses 169.254.4.115 by default. If you still don’t get a reply, then you may have something set incorrectly in your network settings or firewall or security issues. Try going to Help>Check My Computer to see if there are any security setting issues causing problems. That’s it. Using the steps above, you should be able to connect to as many instruments as needed, all at the same time within the same SA job. Figure 5. Performing a trans-track move operation using three trackers.